Selecting the most specific CPT code for a craniotomy to evacuate a hematoma comes down to the documentation, where the hematoma is located, and the approach taken to treat it. 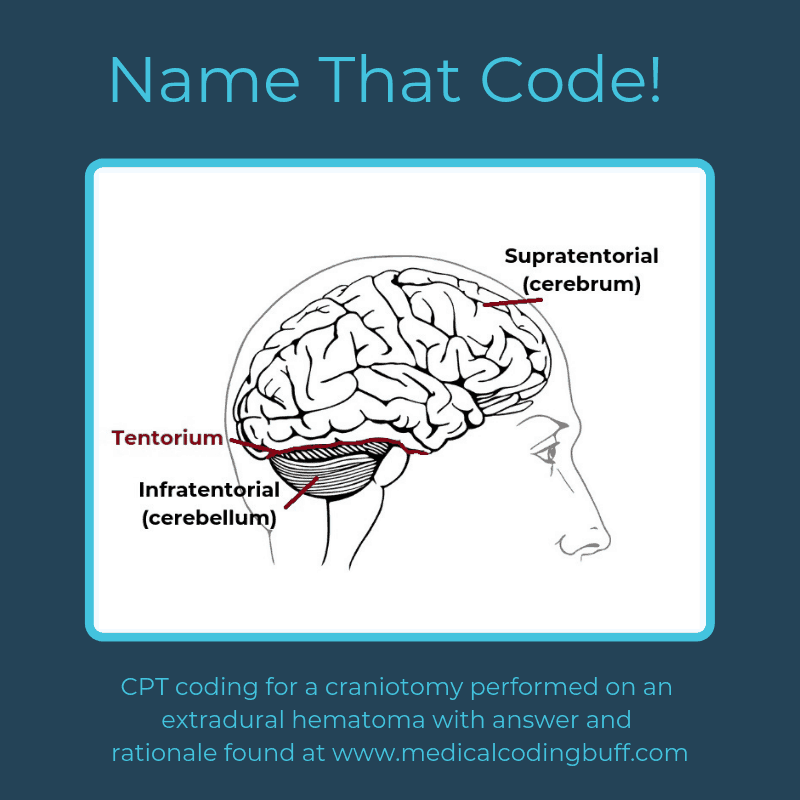 Question: A patient suffers an extradural hematoma in the supratentorial region of the brain, and the neurosurgeon performs a craniotomy to evacuate it. What CPT code should be assigned for this procedure? CPT codes for craniectomy or craniotomy for evacuation of hematomas are broken down by the site of the bleed and the approach the surgeon uses to treat it. These codes can be found by looking at codes 61312-61315. But how do we find the correct code in the CPT coding manual Index? Well, first we want to look under Craniotomy, Evacuation of Hematoma 61312-61315. In the Tabular, 61312 refers to Craniectomy or craniotomy for evacuation of hematoma, supratentorial; extradural or subdural. Whether the documentation states the surgeon performed a craniotomy or craniectomy, CPT code 61312 covers either procedure. Both a craniotomy and craniectomy involve removing a section of the skull, or cranium. In this procedure, the scalp is incised, and then the scalp and bone flaps are lifted to expose the extradural hematoma. Biopsy forceps, gentle suction, and irrigation are used to remove the collection of blood. Once the procedure is complete, the exposed brain is covered with the dural flap and is sutured tightly closed so as to prevent any cerebrospinal fluid leakage. Sometimes a drain is put in place temporarily instead to drain any fluid. The bone flap is then returned to its original location over the dura and closed with steel sutures. What is an extradural hematoma? An extradural hematoma, also known as an epidural hematoma, according to the Mayo Clinic, happens when a blood vessel or artery ruptures between the outer surface of the dura mater and the skull. This outer layer is referred to as the endosteal layer. These types of hematomas are often found in patients with a history of head trauma and often with a related skull fracture. Treatment for hematomas typically requires surgery, such as surgical drainage or craniotomy. What is the supratentorial region of the brain? The supratentorial area is the upper part of the brain that contains the cerebrum, lateral and third ventricles, choroid plexus, hypothalamus, pineal gland, pituitary gland, and optic nerve, according to the National Center for Biotechnology Information, U.S. National Library of Medicine. The supratentorial region of the brain lies above the tentorium cerebelli, a fold of dura mater that divides the frontal and occipital lobes of the cerebrum from the cerebellum. Do You Know the Difference Between Craniotomy and Craniectomy?